Winter is coming so it’s time to choose a stylish coat to keep warm and stay stylish through the cold season. To choose warm coat be sure to check the labels for natural materials like wool and cashmere. The higher percentage of natural fabric the warmer the coat. You can choose any color although darker ones are more practical especially in muddy winter and spring. This military style coat from ASOS consists of 59% wool. It has a matching belt and a full skirt with a drop back. It gives a great shape to the body accentuating the waist. The military style details bring a bit of an edge to its feminine silhouette. Also available in black. This Warehouse neutral coat with flat pockets and a rib collar has 47% of wool and looks great with the casual jeans and matching ankle boots. This beautiful coat is currently on sale at Nordstrom. It comes in three colors – ivory, black, and this eye catchy teal. Made of polyester and wool it features flap pockets, interesting collar and regimental buttons. 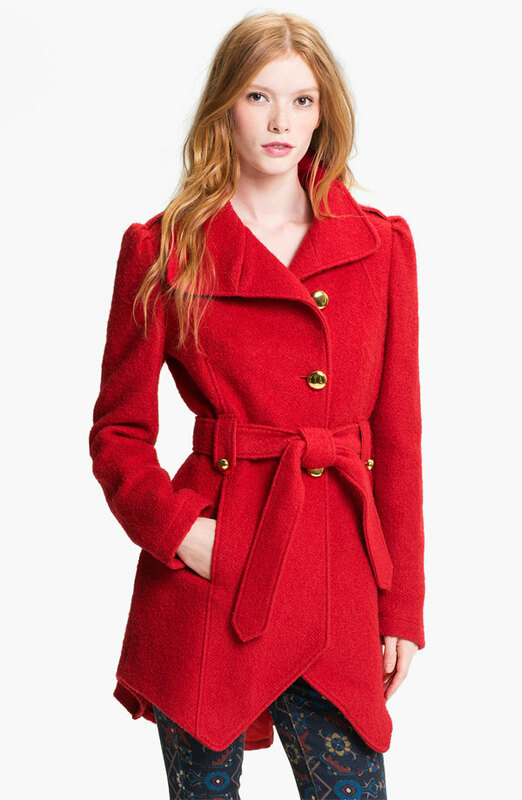 Another assymetrical coat also on sale at Nordstrom comes from BEBE in red blend of wool and polyester. It has angled hemline, shiny buttons, and a removable soft belt. 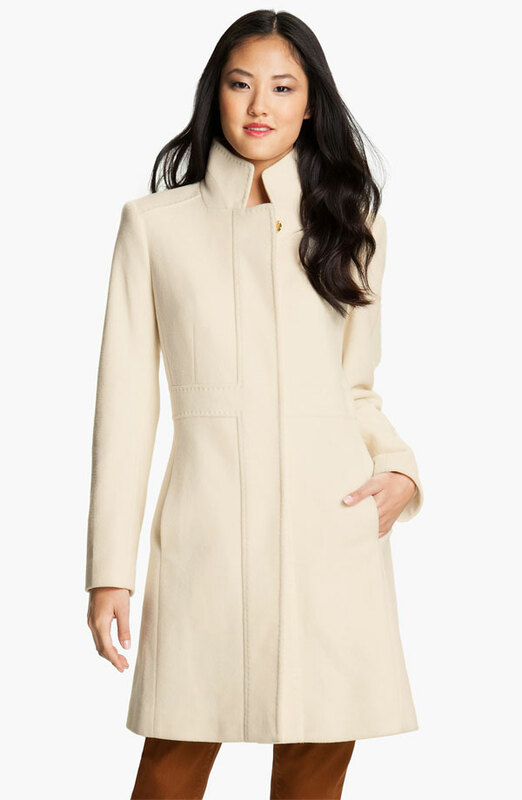 Spotted at Nordstrom this snow white strict coat has an elegant silhouette and comes in a mix of wool, nylon, and cashmere. This classic Calvin Klein Lady Coat comes in three different colors – black, green and pink. And can be found on sale at Bloomingdales. It’s made of wool, nylon, and cashmere with a polyester lining. Betsey Johnson’s wool-blend coat features a full skirt with hidden pockets and a cool buttoned corset that accentuates the waist. A collar made of faux Persian lamb fur is removable. This 56% wool Oasis coat is now on sale at ASOS and beside a nice silhouette it comes with a detachable fur collar. Another feminine coat from ASOS. The navy version of this coat comes with military style buttons while the mustard version comes with matching ones. Fabric includes 60% of wool and polyester lining. This heavyweight poly-wool blend coat with a standing collar is on sale at Bluefly. A beautiful plum color is a great way to sport burgundy trend this season and it also comes in mink (khaki)/macrame.